﻿ English | Yokohama Bike Share "baybike"
Rent a bike in Yokohama. You can rent and return a bicycle at any station you like!! You can select a plan from below. *1.You'll need your passport to buy a "30 Kuri Pass". *2.You'll need your student ID to buy a "30 Kuri Pass(Student discount)". *3. "30 Kuri Pass(Oldies discount)" is for ages 55 and up. *5. "30 Kuri Pass(Ordinary)" is sold in the following stores. You can easily register for membership by PC/Mobile phone. Upon registering for membership, you can use variety of useful functions with reasonable price. 1.You can register for membership by PC or Mobile phone. 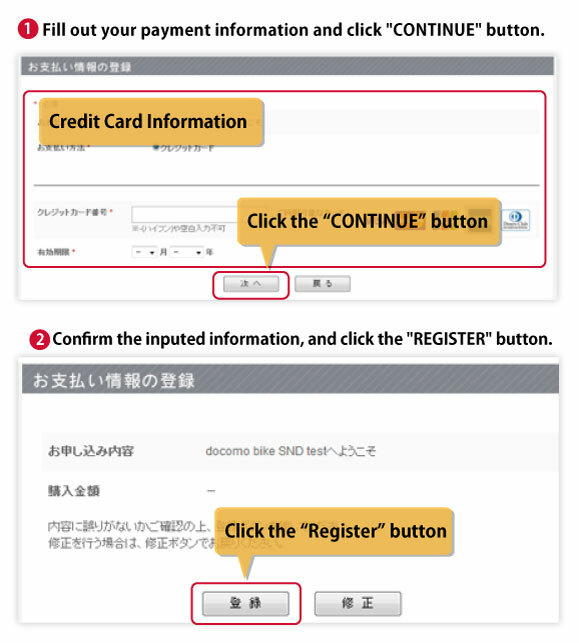 2.Fill out your payment information and the registration process will be finished. 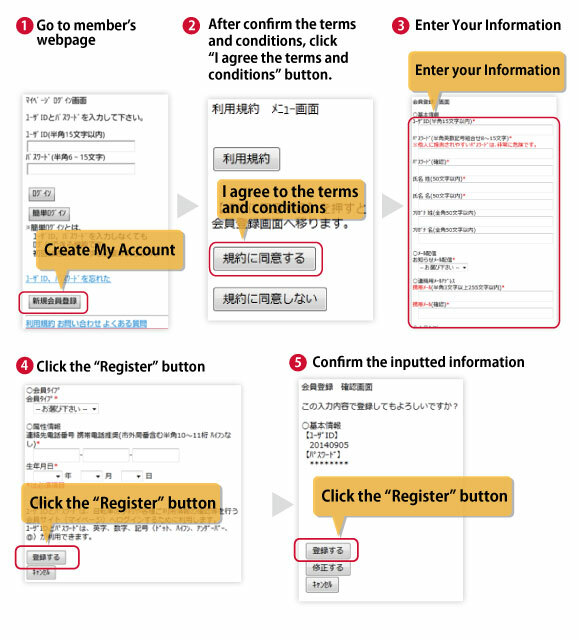 How to Register Membership IC card ? 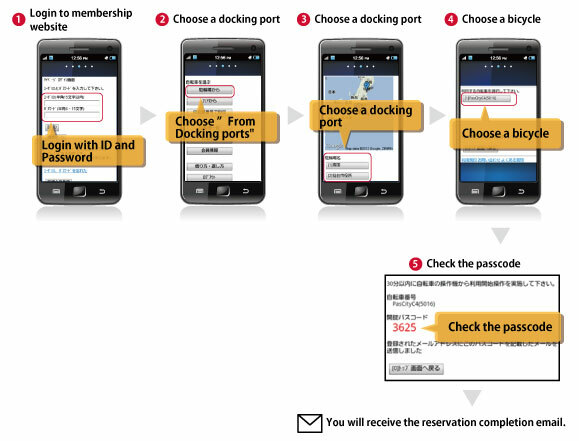 2.Register your own IC card. You can rent a bicycle in two ways. 1. Rent with a passcode. 2. Rent with an IC card (Felica). Rent a bicycle with a passcode. 1.Rent a bicycle by issuing an unlocking passcode. 2.Next, press the “start” button and enter the passcode on the device of the bicycle. 1.Press the ”START” button and then touch your ICcard on the ICcard reader. 1.Park your bicycle at the designated station, lock the bicycle manually with the rear wheel key. 2.Next, press the “ENTER” button on the device of a bicycle. *Every station is equipped with special device which can identify bicycles. The green LED on the control panel flashes at returnable areas. Parking bicycle for a while. 1.Park a bicycle, and lock it mannually. *Some stations are not available for the above-mentioned time. Please see the station map for details. *The service might be tenmporarily suspended due to system maintenance. Copyright © DOCOMO BIKE SHARE, INC. All Rights Reserved.